Grost: Queen to King and mate in one. No! That’s not valid chess lingo! If they’re using English notation, the ‘King’ part makes sense, but there should be a coordinate as well (presumably King 2 in this case). On top of that, ‘King’ in the English notation would be the e-file, while the queen is moved to the d-file. In fact, the right sentence would be ‘Queen to Queen 2’. 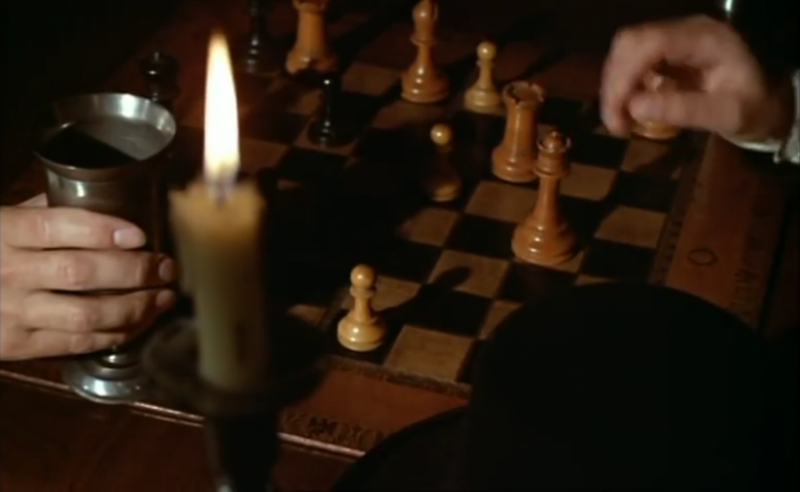 I immediately have to note that black’s queenside is mostly obscured by a strategically placed candle and cup. What is hidden behind them? Some pieces, if Grost’s claim that it’s mate in one holds true. 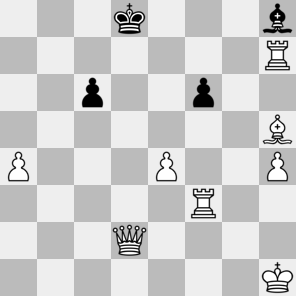 One possibility is that there’s a black rook on b8 or a black bishop hiding on c8.3 Alternatively, there could be a white bishop on a7 at or white knight on a6. Technically, there might be second white queen somewhere on black’s queenside, but that’s pushing the limits of plausibility. Realism: 1/5 Clearly, black has been playing on for too long, but it doesn’t seem too out of place. Except that everything is wrong. There’s the faulty board orientation, of course, but also how did this bishop end up on h8. Probable winner: Grost seems to be up two rooks and a queen. Even if it’s not mate in one, that should suffice.